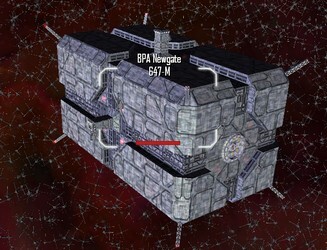 The BPA Newgate is a deep-max penitentiary, specially built as a high-security prison for those inmates deemed too risky to house on inhabited planets -- usually serial felons, terrorists, and escape artists. Not only do several meters of armored plate stand between Her Majesty's guests and freedom, but a thousand miles of hard vacuum in every direction provide an effective deterrent to escape. The Newgate is also the headquarters for the Bretonia Police Authority in the system, and is usually host to more than a few bounty hunters.